Let's talk about the top stories on Wednesday. Before you leave the office or make dinner, check out the top stories from today. On Tuesday, Elon Musk, CEO of Tesla Inc. (TSLA - Get Report) , shocked the markets when he announced that he was contemplating taking Tesla private. He said, and I quote, "Funding secured." 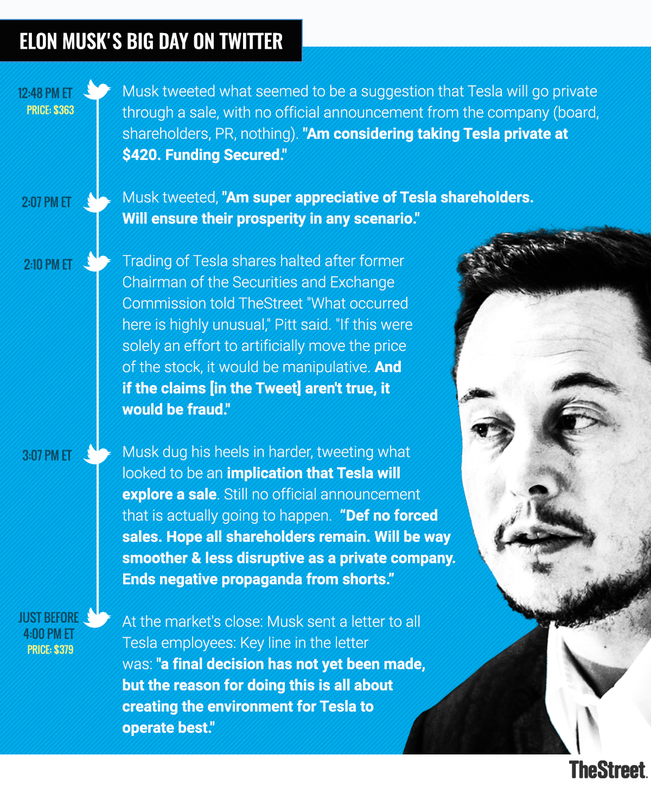 TheStreet's Jacob Sonenshine has been looking into the legality of Musk's tweet. Former Securities and Exchange Commission Chairman Harvey Pitt told TheStreet in a phone interview that if the purpose of the tweet was to boost the share price, and it was untrue, that would be considered securities fraud. "If this were solely an effort to artificially move the price of the stock, it would be manipulative. And if the claims [in the Tweet] aren't true, it would be fraud," he said. "It increasingly looks like this was a spur-of-the-moment decision, perhaps an impulsive decision by him, possibly a response to short sellers who have angered him," John Coffee, a Columbia Law Professor, told TheStreet. And while it has now come out that Musk did meet with board members about a sale, nothing at all is set in stone, it seems at this point. "I could imagine [the SEC] looking into this not with a view to any possible wrongdoing legally or otherwise on the part of Mr. Musk, but just from the point of view of market stability," Robert Hockett, a Cornell Law professor, told TheStreet's Scott Gamm. "I could imagine the SEC and other policy makers might want to think about the possibility of excessive market turmoil maybe being caused by certain modes of communication, such as Twitter." TheStreet's Tony Owusu reported on a note that says that going private might not be so crazy after all. "Based on our ownership analysis, the top 10 mutual fund holders own 41% of shares outstanding, and 'insiders' account for 25% (Mr. Musk's 20% stake and Tencent's 5%)," said a note from Needham. "It is possible to envision a scenario whereby the top holders decide to stay on as private investors, as many believe the inherent value is substantially higher compared to today." That $70 billion may not be the right number if Needham is right. "Tesla might only need to sell 57.6 million shares (or 34%) or $24 billion," according to Needham. Watch Out, Netflix. Here Comes Disney. Jim Cramer's feeling bullish on Walt Disney Co. (DIS - Get Report) . Are you? Cramer said CEO Bob Iger made him feel confident that the ESPN decline has been arrested. He also is fond of the measured approach that Bob Iger is taking for the company's looming Netflix (NFLX - Get Report) competitor product. Looking forward to that Disney app yet? Apparently, the app, "does not have to have anything close to the volume of what Netflix has because of the value of the brands and the specific value of the programs that will be included on it," said Iger. Seems like 2019 may be the year to beat for Disney. Can that mouse be mighty once more? TheStreet's tech columnist Eric Jhonsa thinks that there's a much bigger problem than Snap Inc.'s (SNAP - Get Report) daily user numbers. he Snapchat parent's shares are down roughly 6% in Wednesday trading in the wake of Tuesday afternoon's Q2 report. Snap beat Q2 forecasts —revenue of $262.2 million (up 49% annually) and GAAP EPS of negative $0.27 beat consensus estimates of $249.5 million and negative $0.31 but also guided for Q3 revenue of $265 million to $290 million (up 27% to 39%), which is almost entirely below a $289.2 million consensus. CEO Evan Spiegel insists Snapchat's controversial redesign, which it has backtracked on to an extent, is to blame for its DAU pressures, but it's hard to overlook Instagram's competitive impact. Whether at 188 million or 191 million, Snap's DAUs are equal to less than half of what Instagram claims for its Stories product alone. Curiously, Snapchat's approach to disclosing user growth stats is the reverse of Twitter's (TWTR - Get Report) . Twitter, looking to draw attention away from its tepid MAU growth, has been disclosing healthier DAU growth rates, but without sharing how many DAUs it has or has added. For Q2, Twitter reported its DAUs rose 11% annually, but also disclosed its MAUs rose just 3% to 335 million, with flat growth in the U.S.